There are so many things to consider when purchasing a gun safe. Be sure to check with your state to make sure the safe you are considering is compliant with local laws. Battery powered gun safes are just one of the many types of safes used to keep a firearm out of reach from unwanted hands. Key, and analog are two other types of gun safes. Gun safes have various types of locks ranging from high tech fingerprint recognition (biometric) to passcode and key type locks. Most models have several locking mechanisms in place to prevent unauthorized access. When choosing your gun safe be sure to pick heavier safes with more difficult locking mechanisms if you have children. The size of your firearm is also a major consideration. 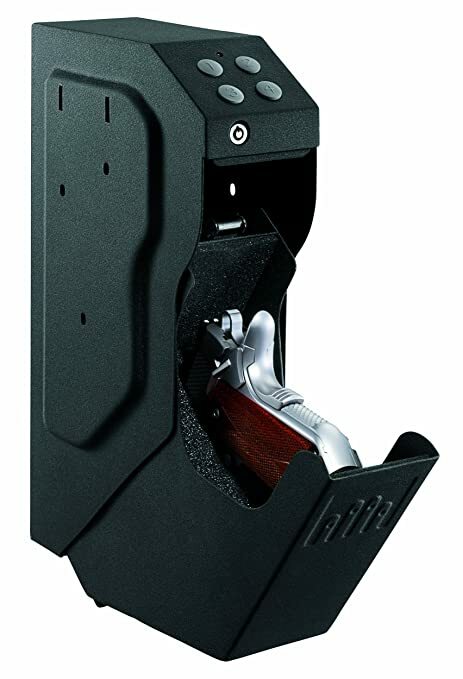 Bedside gun safes come in a variety of sizes from micro to large. It is important to look at the interior and exterior dimensions of the gun safe you choose. The exterior dimensions will help you determine if you have enough space to store it, while the interior dimensions can determine if your gun will fit securely inside. Is it made of steel and at what gauge? Does the inside contain a foam lining to protect your gun and valuables? Is it fire and/or waterproof? Typically a gun safe kept in a bedroom is meant to hold a single firearm. However some models are large enough to hold other valuables or ammo. Weight can also be an issue. If you are an on the go person you may want to consider a more lightweight option if you need portability. Some safes come with the option to mount or unmount as needed. If you need something durable a mount type safe is a better choice. Other things to consider are what types of batteries it uses and the specs of the warranty offered. Some models offer specialized features. There are models you are able to open with only one hand and some that have virtually no sound when you open them. Models that have back up keys are important especially if they are battery powered. You don’t want to be without access to your firearm in the event your power source dies. These are all important things to consider when making your gun safe purchase. Quick entry with three to eight digit "no see" keypad. Dimensions: 11 inches by 8 1/2 inches by 2 1/4 inches Interior dimensions: 10 3/4 inches by 6 1/2 inches by 2 inches. This bedside safe by GunVault is a combination style safe. One 9V battery changed periodically is needed for proper and long lasting use. This model can be mounted to the place of your choosing, whether you want it on the wall, floor, or a nightstand. It comes with a unique key that can be registered with the company. The GunVault SV500 comes equipped with a quick access digital keypad and the door opens downward so you can access your gun quickly in an emergency. Your firearm will be safe from scratches or dings as this model is lined with foam. The safe itself is made from eighteen gauge steel for extra security. The design feature of this safe makes it one of the quicker options for accessibility. Size dimensions are 6.5” x 3.5” x 13” and weighs a little over eight pounds. This model is definitely unique, sturdy and dependable if you are looking for a quick access option. This safe is great being both a portable option mounted in various locations near the bed. It is a smaller unit that has mounting holes so it could be mounted to a wall, on the floor, or under a nightstand. It is equipped with a quick entry system and spring loaded open/close mechanism for easy access in time of need. There will be no fumbling around for a key or lengthy code to enter with the number pad at your fingertips. This gun safe is made of heavy duty eighteen gauge steel with an interior made of padded foam. The steel keeps it safe from entry or break in, while the foam will keep your gun scratch and dent free. The First Alert 5200DF weighs only seven pounds, so you can quickly take it on the go if you need too and runs off of 2 AA batteries. The interior is 9” x 10.9” x 3.3” so be sure to check your gun size. The gun safe by First Alert comes with a five year warranty so rest assured your investment will be around and working properly for years to come. The GunVault safe is a lightweight option to protect your firearm. It is constructed from sixteen gauge steel with a black coating to keep it camouflaged in the dark. There is a lining of foam inside providing protection to your gun. This safe is also convenient if you need a gun safe you can take with you on the go. Its small, weighing only five pounds and the dimensions of 11” x 8.5” x 2.25” make it the most portable. It will also mount to a wall or dresser. The sturdy design prevents intruders from breaking into the safe, should it be stolen or lost. It is equipped with a conveniently located keypad to allow users to unlock without looking. And the buttons can be programmed with a vast combination of access codes. 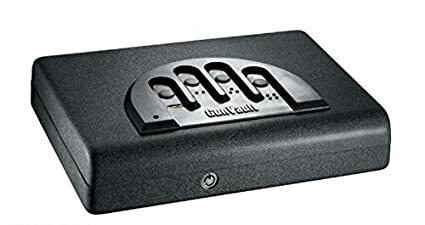 The GunVault runs off of a 9V battery and is backed up by a key, so there is no need to worry about forgetting your passcode on this portable model. This safe is not recommended for families with kids, but does an excellent job of keeping your gun safe and secure. This budget friendly gun safe will keep your firearm hidden, while making it easy for you to obtain access in case of emergency. The Stack-On is made of solid steel and has steel doors that make it difficult for intruders to pry in. It is equipped with locking bolts and concealed hinges for added security. This Stack-On model comes in a black finish with a silver lock. This safe is easily programmed by the owner and comes with a key for overriding. This model will shut off after three failed attempts to unlock. The PDS-500 comes equipped with mounting hardware, so it can be installed in a drawer, on the wall, or other location in your bedroom. The dimensions of this safe are 11.8” x 8.6” x 4.2” and it weighs slightly over twelve pounds. The safe is backed by a three year limited warranty and is great for those on a budget. This safe by Sentry will provide you with a durable and quiet way to access your gun. It is equipped to hold a J/K revolver up to a full size handgun. This model is designed to be opened with just one hand and is makes no sound upon opening. 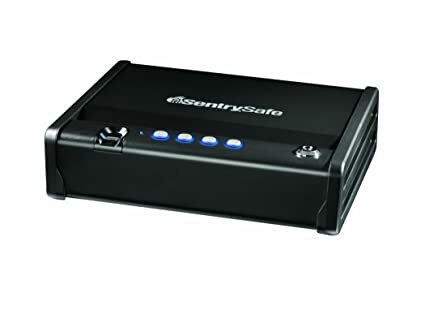 The Sentry Safe Biometric Pistol Safe is made from twelve gauge solid steel that is reinforced, making it very durable. 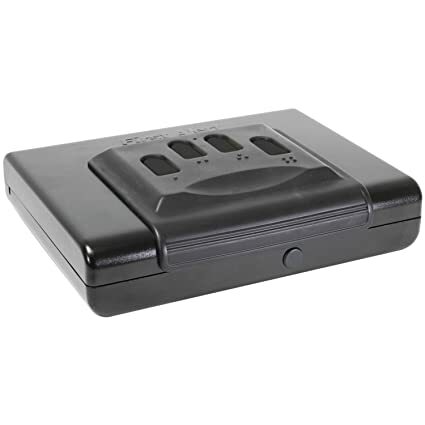 The Quick Access Pistol Safe by Sentry includes a backup key in case battery power is drained. This is a model that can be mounted in the location of your choosing or stored away. The exterior dimensions are 3.2” x 12” x 9.9”. It only weighs twelve pounds so it is moderately lightweight. You will need four AA batteries for proper operation. If you are looking for a fingerprint type entry that is relatively light weight, this is a great choice. The Barska safe is one of the heavier models and can hold all of your valuables along with your gun. The safe comes equipped with a fingerprint pad that is programmable for the user to gain quick access. The fingerprint area can be cleaned with just a dry cloth and requires minimum maintenance. Just replace the four AA batteries periodically for lasting use. 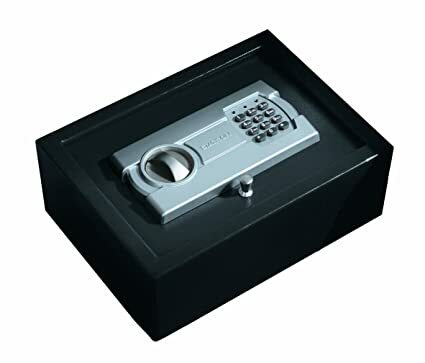 This model can be programmed to open to thirty different fingertips, so multiple users are able to access the safe if need be. The Barska safe comes with instructions to help you troubleshoot any problems. This safe measures at 16.5” x 7.75” x 14.5”, so there is plenty of room for a firearm and a few valuables. This model is constructed from solid steel and has a two point deadbolt locking system. The two point system will help to guarantee security of your firearm and valuables. The Barska Biometric safe can be mounted in the place of your choosing and the mounting hardware included. 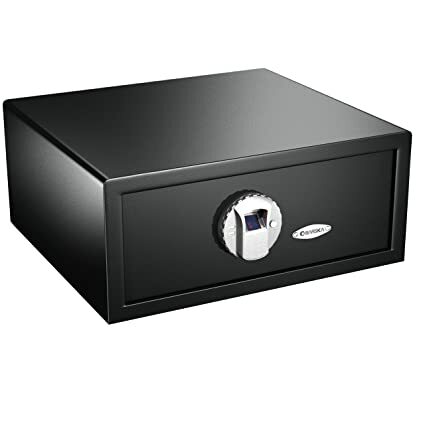 This safe also comes with two backup keys, so you won’t have to worry about battery life. It weighs in at thirty one pounds, so this is one of the most sturdy of our picks. This high end safe is a great user friendly heavy duty option. Choosing the right gun safe is just as important as choosing your firearm. Security and safety are of the utmost importance for any gun owner. Be sure to choose a gun safe that can be quickly accessed by you, but tough enough to deter intruders. Lastly, make sure to check state and federal laws to make sure your safe is in compliance!